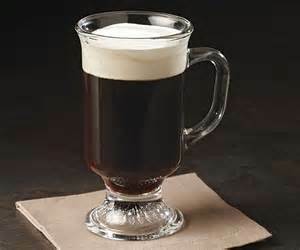 Arizona Renaissance Woman: Irish Coffees for Brunch (or other times as needed)!!! Irish Coffees for Brunch (or other times as needed)!!! If you read my latest taco post, you might have noticed that I made delicious Irish coffees to go with my apple brunch tacos. They're pretty easy to make. If you've never tried one, here's how I make them. 1. Start by placing a tablespoon of brown sugar in a large coffee mug. Our mugs hold a little over 12 ounces. 2. Add a healthy shot of whiskey. In the picture below, the shot looks gigantic! It's actually not - the shot glass has a line just below the top that says 1.5 ounces. I fill it all the way to the top! Muddle the whiskey and sugar with the back of a spoon. 3. Add coffee to taste. I like the mug to be about two thirds full at this point. I made a pot of French press coffee for these this morning, and they were fantastic! Strong, good quality coffee makes a difference! 4. Top with a few generous spoonfuls of whipped cream. Enjoy! but we don't have any. I think ours also look pretty good. And, more importantly, they taste fantastic! These are pretty decadent, so I only make them every once in a while, but they're so good! Another plus is that the coffee makes it a legitimate brunch drink, so it doesn't even have to be five o'clock somewhere. Well, it still is . . but . . . you know what I mean! Do you have another tried-and-true method for making these? Please comment below! Thanks for reading!